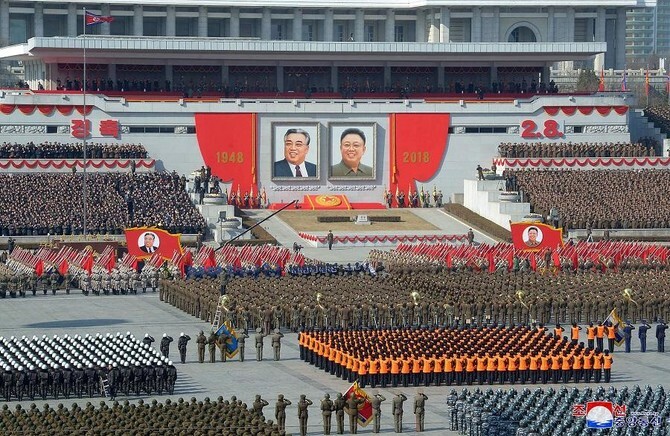 North Korea staged a huge military parade on Sunday to mark 70 years since the country's founding, but avoided jeopardizing ongoing talks with the United States by not displaying its most powerful weapons and making no mention of its nuclear program. 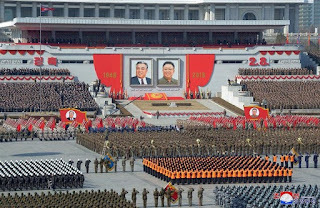 The country's leader, Kim Jong-un, attended the march, but did not address the crowd which was estimated to be about 50,000, according to the Associated Press and CNN. Kim Yong-nam, head of North Korea's parliament, delivered a speech that focused on the economy. Kim Jong-un watched the parade with the head of China's parliament, Li Zhanshu, and "they locked hands and raised arms at the end", CNN reported. The speaker of the Russian parliament's upper house, Valentina Matvienko, also attended.